Dear Friends: this morning I was ready to go back to my first Spain Chronicle, after my website was hacked a week or so ago (more on that later), but first I checked the Guardian news and saw the terrible events in London yesterday – where seven people were killed on London Bridge when run down by terrorists in a van and others stabbed. I was further horrified to see Portland, Oregon sharing the front page with an article about a white supremacist who a week ago, on a city train, fatally stabbed two men and injured another after they came to the aid of two young women being subjected to anti-Muslim racial abuse. What is happening to our world? Our own world. Three days ago we were in London and enjoying a night tour with friends near the London Bridge. In little more than two weeks, we will be at home in Portland, where a rally is to be held today, Sunday, June 4, to mark the deaths of the two men. White supremacist groups called the Oath Keepers say they will attend the rally to “provide security” and the chair of the city’s Republican party told the Guardian he was considering contacting groups like these to provide security for party events. Although in the face of all this it seems superficial to be writing about our trip to Spain, I will go back to where I left off a week ago, when this was the title on my website: . And when I tried to log in I got this encouraging note: The explanation from my Portland website host was just about as mystifying, but at least they’ve put me back in business. Desire paths – the title of this chronicle. I’m a fan of Spitalfields Life, a daily blog by “the gentle author” in East End London who writes daily about past and the present – working class people, markets, historic buildings threatened with demolition, parks, cemeteries, spring flowers, and cats. A couple of days ago he wrote about “desire paths” – user-created pathways between the shortest or most easily navigated way, often in defiance of authority or established sidewalks. I was captured by the idea, both as metaphor and by our lives; I love to cut across fields (and gingerly climb over an electric fence as we did yesterday), step off the concrete to walk on that parallel path, or just bushwhack between our trail and that one on the other side of the ravine (that recently got us into trouble). 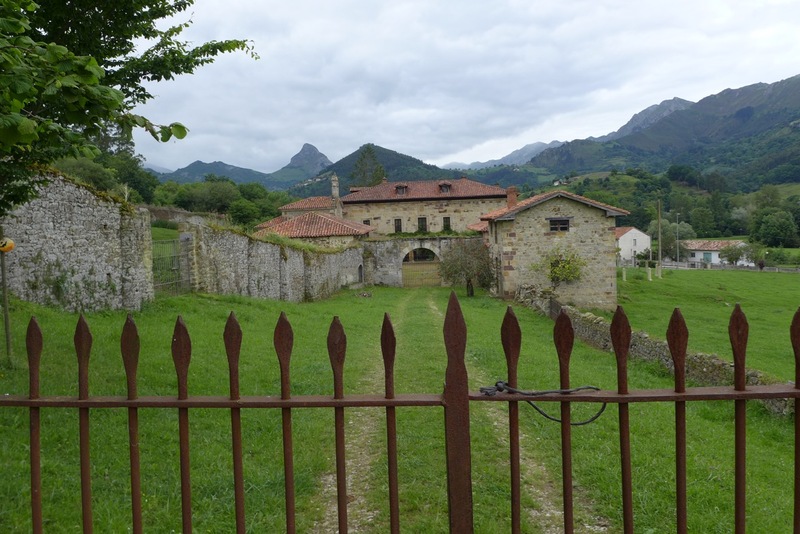 Today – Sunday, June 4, we are in a small town of Panes (pa-nays) in the Picos de Europa, a mountainous area in the north of Spain, in Asturias. 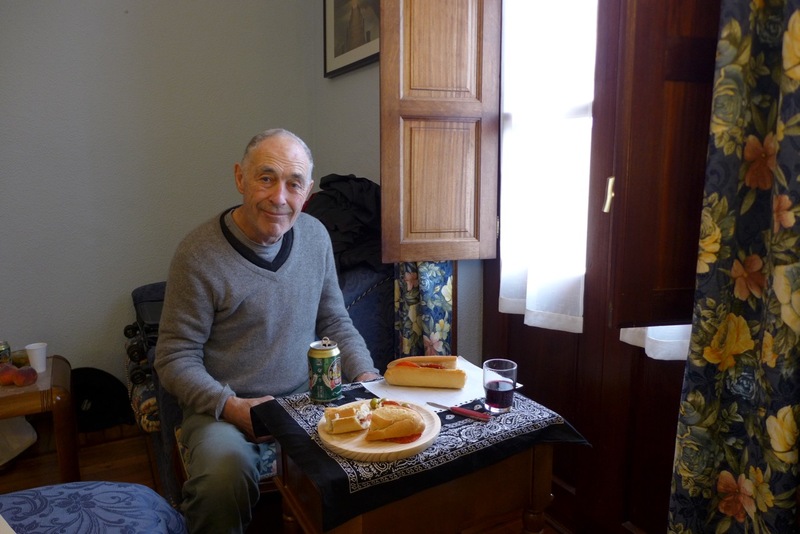 At the moment it feels just like Cañar – cloudy, raining, 57 degrees F, and we are huddled in our rural hotel room with the picnic bought for our walk today. Which will now be a picnic in our room: Michael worried about leaving crumbs in the room so to cut the bread he stepped out onto the balcony, where it looks like this. Those are high mountains in the distance, covered by clouds. 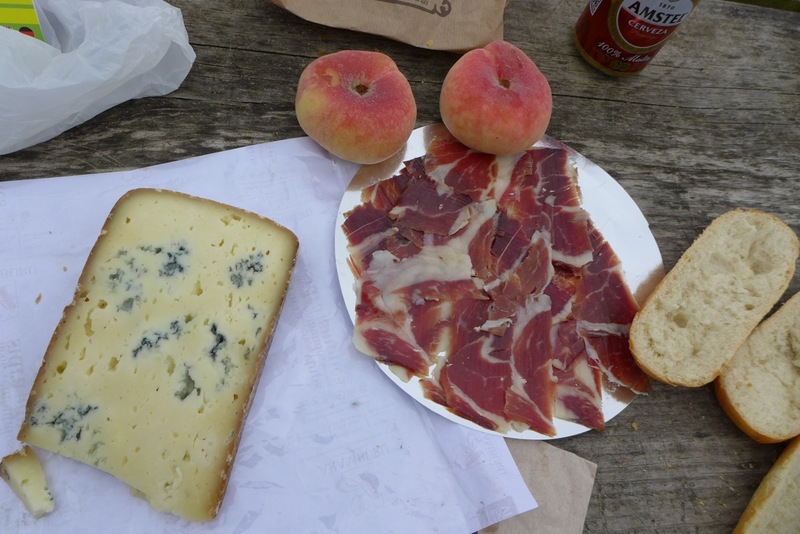 Tomorrow we’ll drive through them to a place called Cabrales (of stinky cheese fame). During our first two weeks in Spain, however, the weather was glorious. 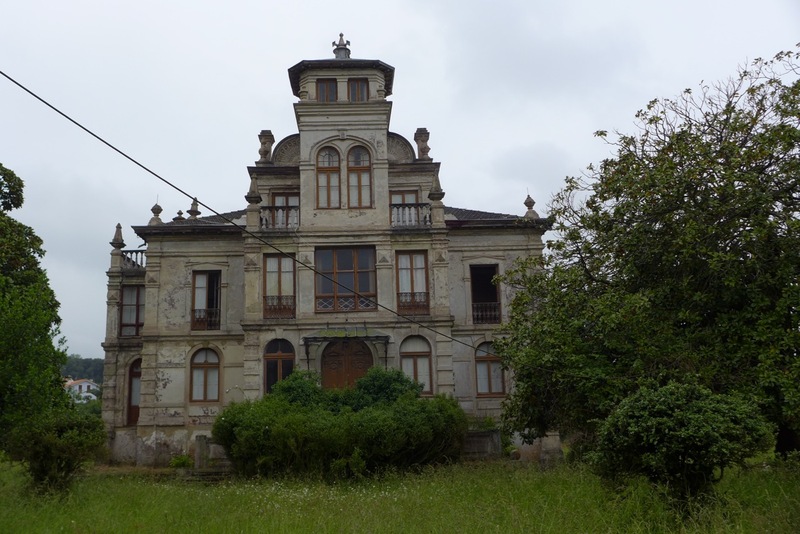 Madrid – Bilbao – Pamplona – Bilbao – Asturias. 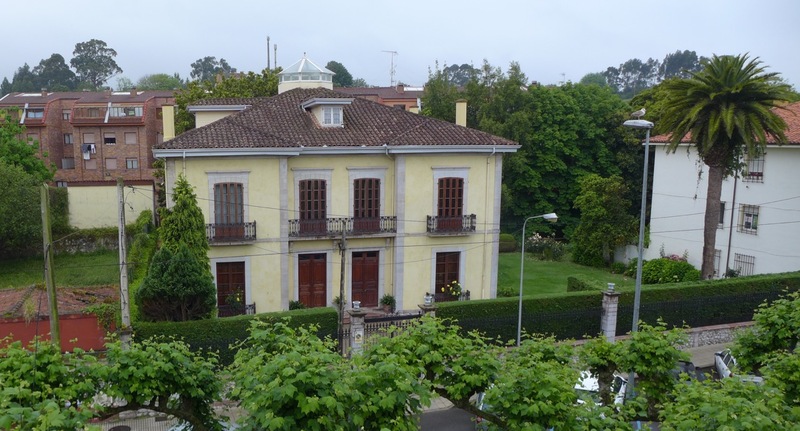 Last time I was in Pamplona was in 1968, on my first trip to Europe with my two sisters – a graduation present from our parents. 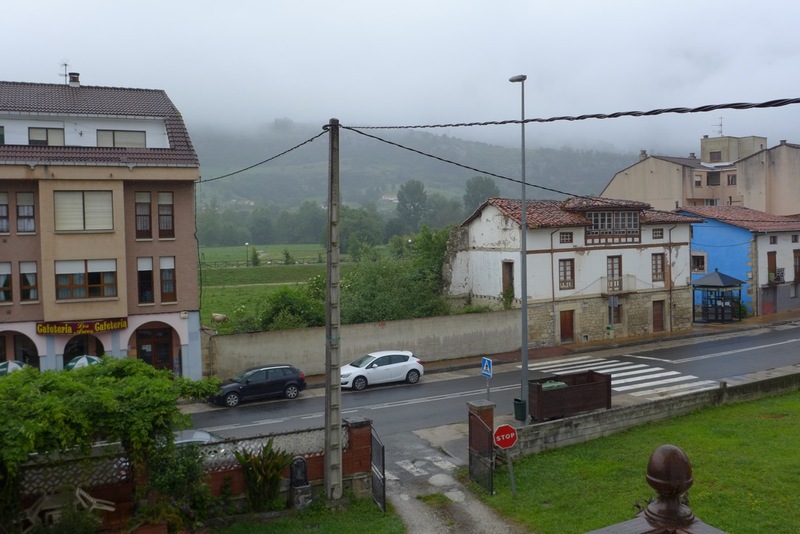 All I remember of Pamplona is a campground with many others looking like us – long hair, short skirts, VW campers – (were we camping too? 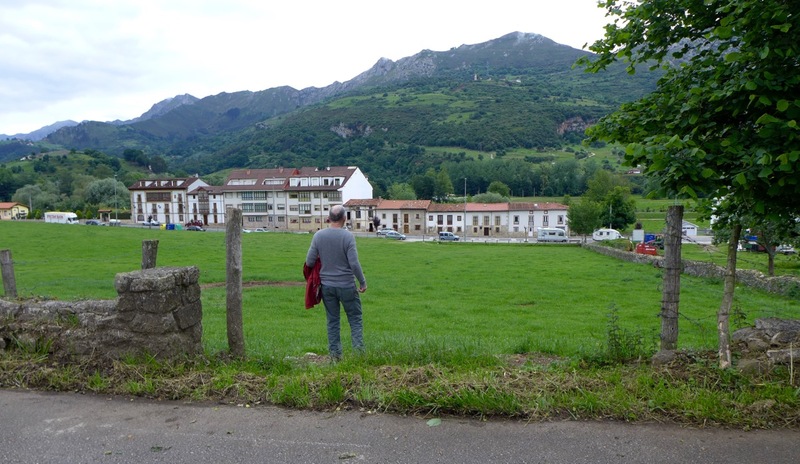 I don’t remember), but certainly oblivious to the fact that we were in Franco’s Spain. Just as we had been oblivious to the strikes in Paris where we had been that June, or later in July to the military government that ruled Greece. In other words – we were American flower girls, not quite mindless but certainly unaware of events in the rest of the world. The photo alongside was not us then, but maybe seven years ago at the wedding of nephew Alex and Elena. I’d never seen the photo until last week when it popped up on FB. 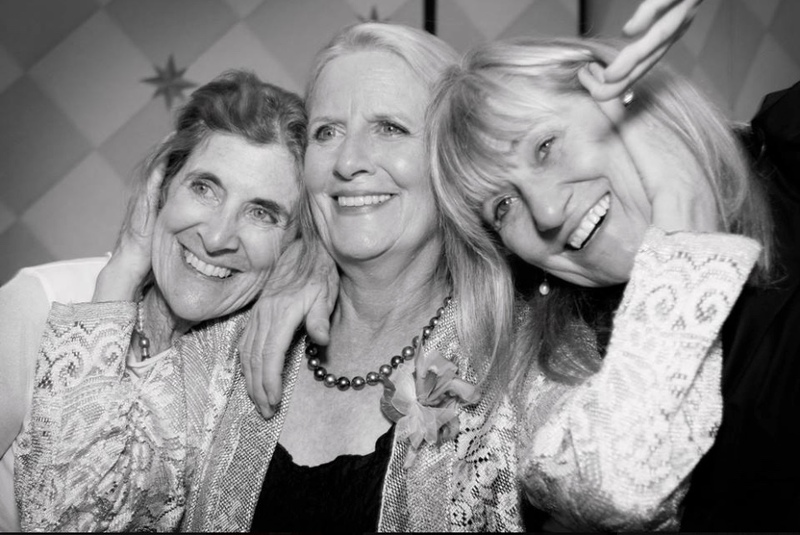 That’s Char, happy mother of groom, in middle; Sherry on left, me on right. Anyway, I am wanting to say that in Spain this time we are following “desire paths” – no fixed itinerary, no tours, no guides, just going where our serendipitous wayfinding takes us. 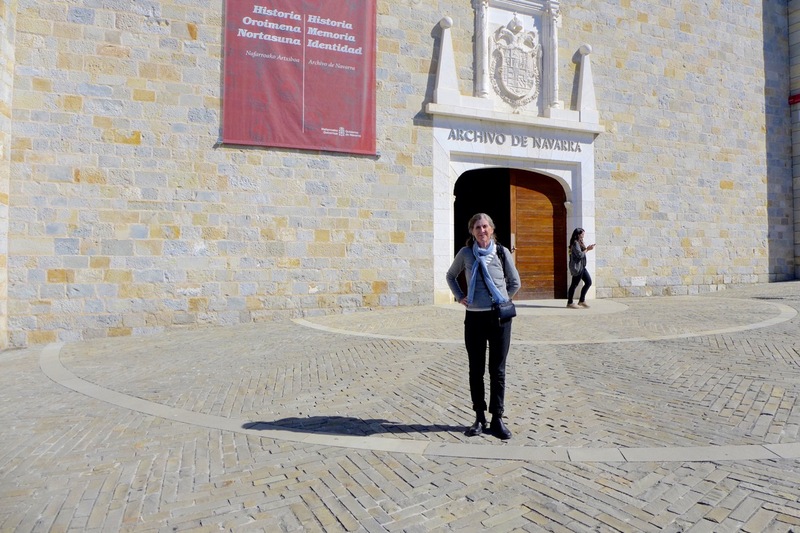 In Pamplona, I discovered the Archivo General de Navarra and talked to an archivist, Diego. 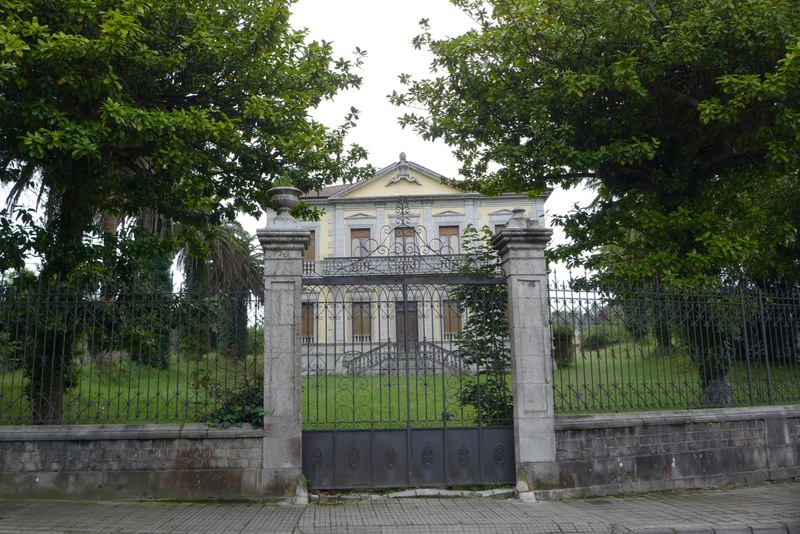 When I asked about the oldest document in the archive, he deadpanned “1000 years” – and brought it up on the screen.The building itself is from the 12th century, refurbished and sensitively modernized by Spanish architect Rafael Moneo. A dream of a building for those lone-arranger archivists like yours truly. That’s about it for now. 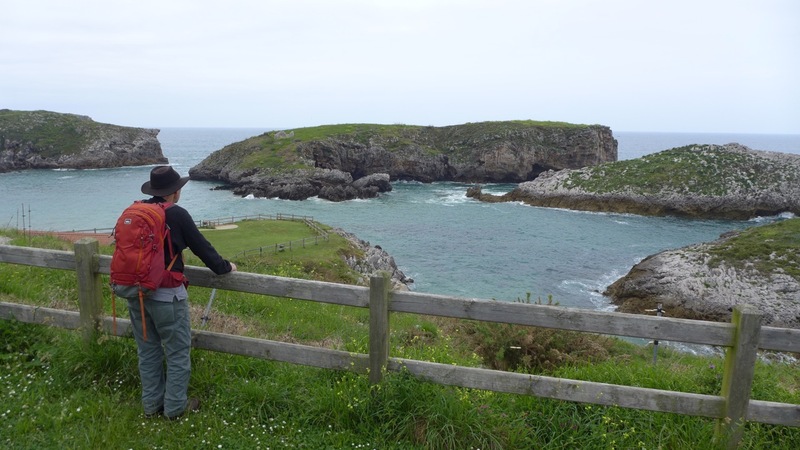 I’ll end with two photos from Llanes and our last beautiful weather day, when we walked along the coast and had our first picnic of the trip. 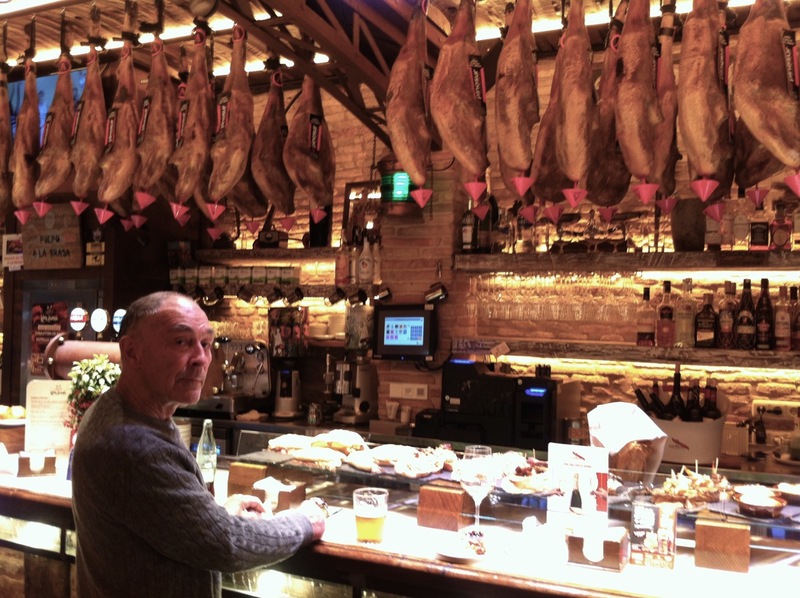 Michael shopped hard for that ham – bellota – cut by hand “with the bone in.” No machine-sliced ham for us! Please stay in touch – I love hearing from you all. 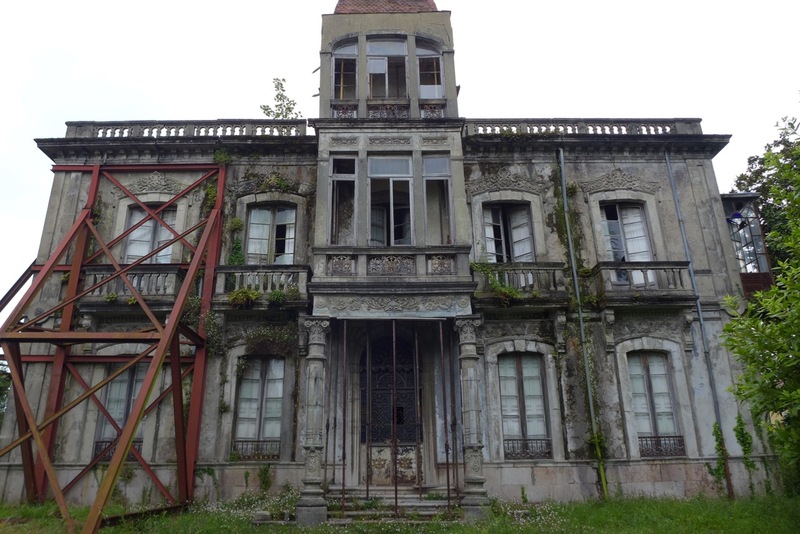 This entry was posted in travel by judyblankenship. Bookmark the permalink.